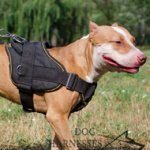 The Best Ten Leather Dog Collars for Any Purpose and Taste! 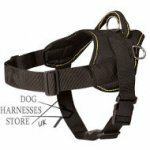 Good quality collar suits the temper of your dog. 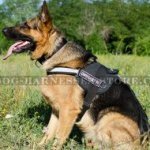 A "Gun Hunter" and natural leather dog collar are mismatch as leather is too sensitive to wet. 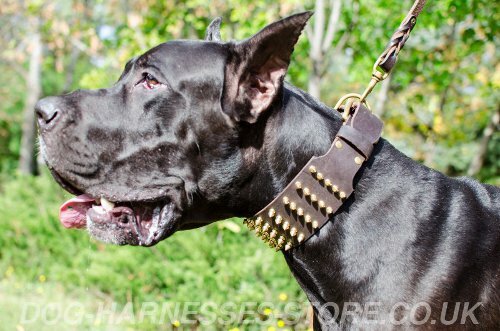 At the same time, a "Couch Baron" with strong leather dog collar is really equipped to a high standard, he can make a sally to the Norwegian Hammerfall, leaving no traces. 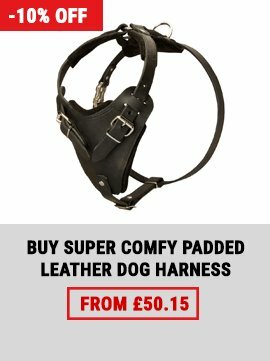 Perfect Leather Dog Collar Is Ideal at All! Color of coat is also important. 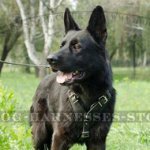 The dog with black coat may wear black leather dog collar, however brown or tan leather dog collar will look rather luxurious visually because of contrast. Finally, availability of money influences on the perfect dog collar choice. 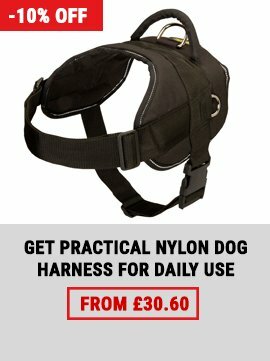 Nylon dog collars are cheap. It's a reliable alternative to start with. 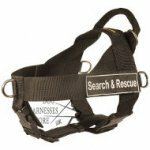 Nylon dog collar is wet and water-resistant and offers freedom of maintenance. 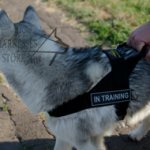 But this collar isn't extra durable: within 2-3 years it looks as if the dog had been tracked the Gobi three times being with the nylon dog collar on. Faded and frayed. 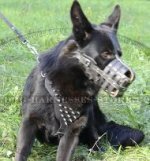 Quite otherwise situation is with leather dog collars: sensitive at once, but if they are properly taken care of, they keep the shape and look, and even may be run in the "family". 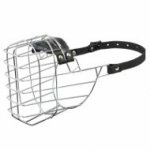 Never dry wet leather dog collar on the radiator, because the heat makes the collar breakable and friable. 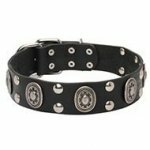 This is a real bestseller among leather dog collars because of the width and rich decor. Extraordinary design, gold-shining brass spikes and top quality won't leave cold even the most exacting customer. 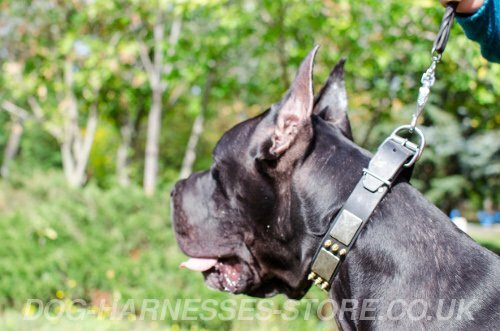 This extra wide leather dog collar is perfect for medium-sized and large dogs. 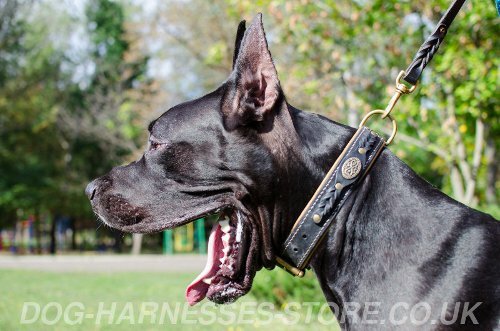 Luxury leather dog collar with brass decor in imitation of old bronze, handmade braids, solid brass fitments and soft Nappa lining inside for maximum comfort, safety and royal style of the dog. Royal Design, Comfort and Quality in One Leather Collar! 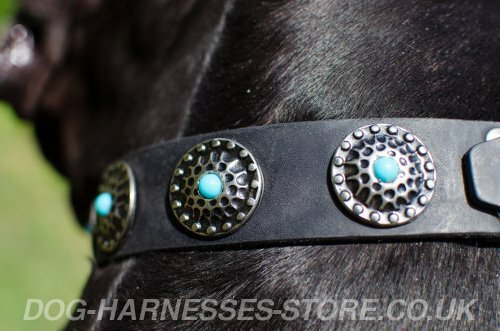 Vintage style dog collar with turquoise stones and silver-like embossed circles is an exclusive model to lay emphasis on the dog and to give it exceptional convenience while long walks and other daily activities. 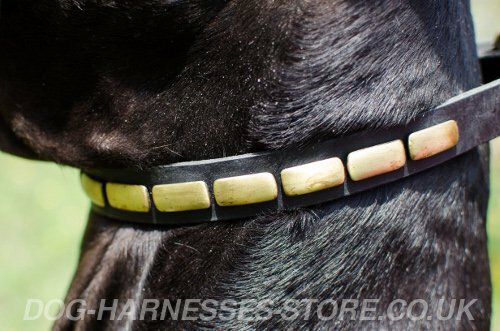 Wide leather dog collar with oval brass plates for retro style fanciers. 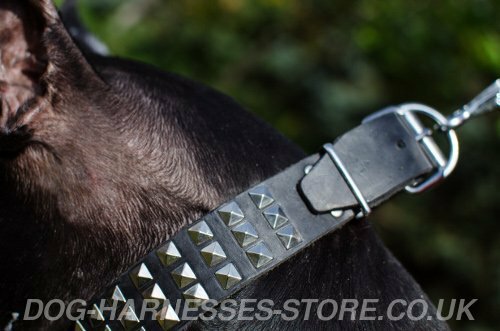 Bring out the beauty of your dog and show your taste with this super comfortable and hard-wearing collar with rust-resistant adornment and hardware. 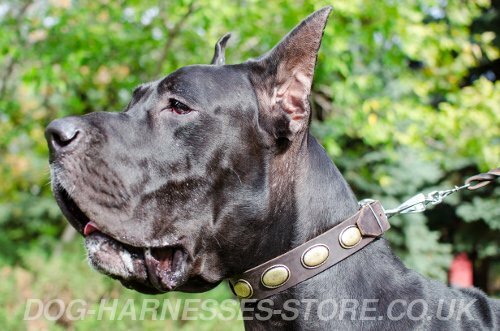 This elegant leather dog collar is perfect for walks in style and shows. Thick and durable genuine leather and a row of brass plates in necklace style make an ideal combination of quality and style. 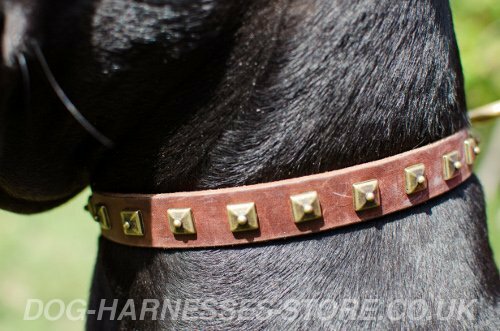 Another one model of elegant leather dog collar with gold-like square brass studs. 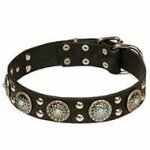 Superfine dog walking collar with divine look for those who follow fashion! 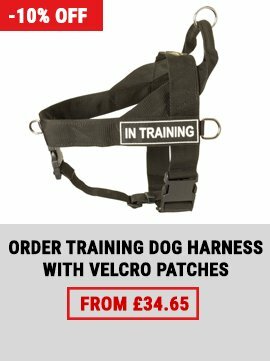 Perfect for your dog's daily activities. Selected leather, semi-antique decor and solid hardware. Brass plates in imitation of old bronze and nickel pyramids for unsurpassed style. Antique style is always on trend! 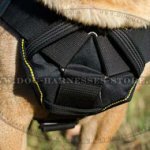 Fashionably functional collar to show your dog's individuality and to provide convenience and comfort during long walks. Inimitable design. Mix of silver-like nickel plates and brass spikes. The collar is above all the praise! Choose style and comfort for your dog with this modern leather dog collar! Original combo of nickel-plated pyramids and brass studs for those who don't afraid to be in the limelight! Studs and Pyramids Look So Cool on Natural Leather! 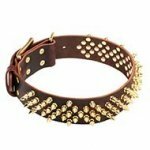 Wide leather dog collar with three rows of square glossy studs is the latest trend in dog fashion. 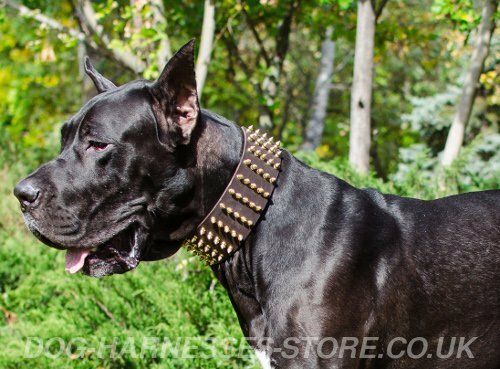 Your dog will look like a real rock star wearing this stunning collar! 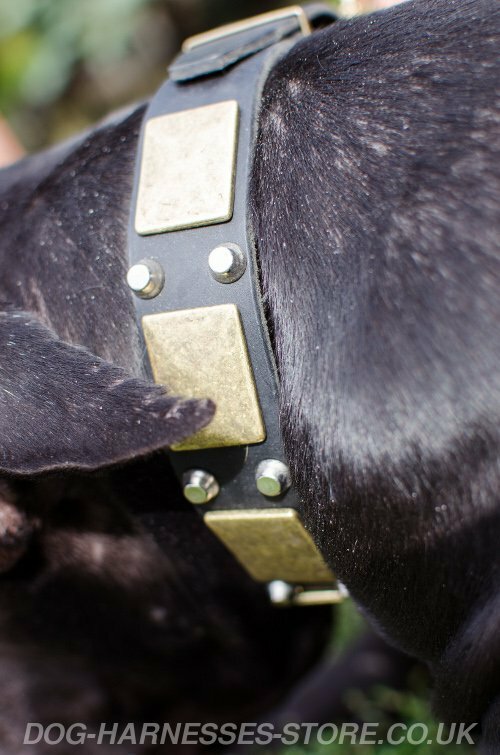 Shining Leather Dog Collar Looks Like a Jewelry! Do you want your dog's leather collar to have rich, shining look and to serve as long as it is possible? Then you need special balsam to provide proper leather care for the accessory! 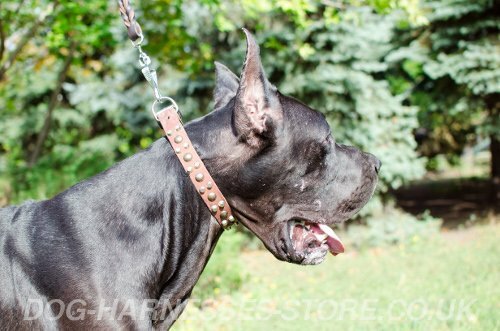 The leather dog collar you have will always look like new with softcare balm! 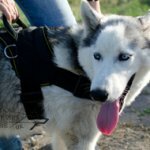 Read also how to train your dog to wear a collar with pleasure.